Throughout the years of late-prehistory, AD 1400s – 1700s, and through much of the 1800s, the canoe was a principal means of travel in ancient Hawaiʻi. Canoes were used for interisland and inter-village coastal travel. Most permanent villages initially were near the ocean and at sheltered beaches, which provided access to good fishing grounds, as well as facilitating convenient canoe travel. Back then, land travel was only foot traffic, over little more than trails and pathways. June 21, 1803 marked an important day in the history of Hawaiʻi land transportation and other uses when the Lelia Byrd, an American ship under Captain William Shaler (with commercial officer Richard Cleveland,) arrived at Kealakekua Bay with two mares and a stallion on board. Shaler and Cleveland then departed for Lāhainā, Maui to give the mare and stallion to King Kamehameha I. Until the mid-1800s, overland travel was predominantly by foot and followed the traditional trails. By the 1840s, the use of introduced horses, mules and bullocks for transportation was increasing, and many traditional trails – the ala loa and mauka-makai trails within ahupua‘a – were modified by removing the smooth stepping stones that caused the animals to slip. A few remnants of the early uses of horses to get around can be seen. Circular indentations in curbs adjoining streets show the location of hitching rings used to tether horses outside businesses. Typically, the evidence is iron stubs that fastened the rings to the curb. In Hilo, some curb rings can still be seen; along the curb of Kamehameha Avenue are two-inch rings spaced at intervals. Today, Hawaiʻi remains strong in the ranching tradition. Remnant hitching posts can be found outside of some businesses and homes. Rodeo grounds can be seen on most of the islands. In 1868, horse-drawn carts operated by the Pioneer Omnibus Line went into operation in Honolulu, beginning the first public transit service in the Hawaiian Islands. Honolulu resident HP Baldwin is credited with having the first automobile back in October 1899 (it was steam-powered.) The first gasoline-powered automobile arrived in the Islands in 1900. In November of 1900, an electric trolley (tram line) was put into operation in Honolulu, and then in 1902, a tram line was built to connect Waikīkī and downtown Honolulu. The electric trolley replaced the horse-mule-driven tram cars. 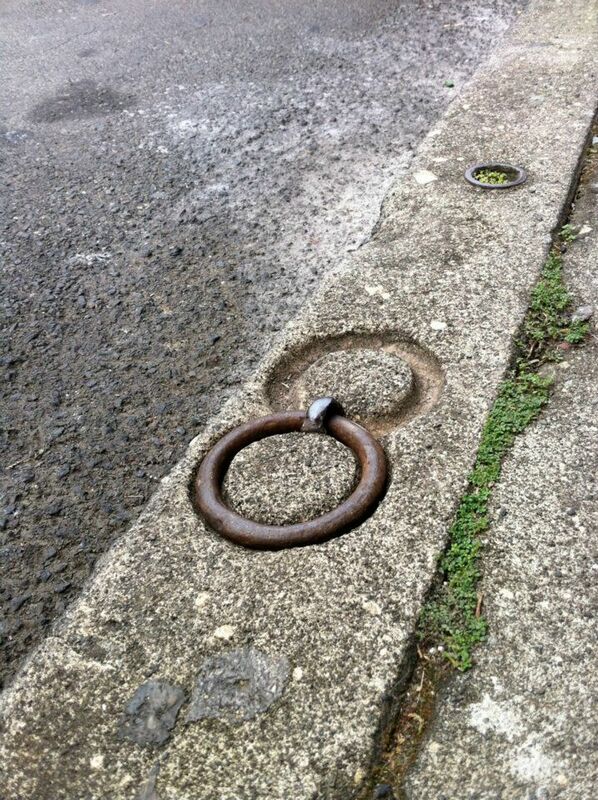 The image shows a horse-tethering ring on a Hilo street. In addition, I have added other horse-related images in a folder of like name in the Photos section on my Facebook and Google+ pages.